Here are the advantages and disadvantages of using USB cables for printers. 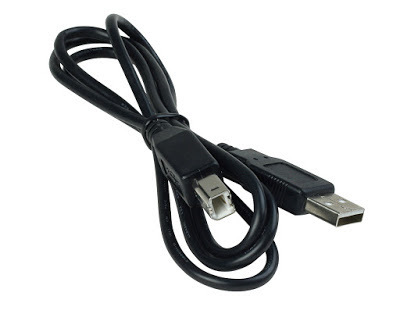 The type of USB connector for printers is the method used to connect a printer to the computer, this connection method came to replace the previous parallel cable is used to connect printers as 640C, 810C, 830C, 840C, 880C, 895C , 930C, 950C and 970C only to give examples. Methods for connecting printers is the one that best about compatibility you have with computers and a USB port is available on any computer, both table as a portable type of USB connection thanks to occupy little space can be adapted to a laptop and can put several on desktop computers. This connection method is compatible with most operating systems including from the oldest to the most modern in contrast to other connection methods that do not work today. Motherboards or modern mother board all have at least two USB ports connection change and are not adding ports for connecting printers prior to this. Easy to connect both the computer and the printer, anyone with possibility even touch the connector can identify where he goes every cable terminal. One side of the cable connects to the printer and the other side is connected to the computer, requires no more than push and this fall both the printer and the computer. Previously many connectors giving trouble to the operation of the printer for the simple fact of any printer connector present problems and we had to change the cable. Finally the possibilities that gives the USB cable are many, unlike other connectors is very versatile and fast. The only disadvantage of this type of connection is whether this is connected at the right time the printer will not function.